“Is playing at life, life? Is playing at life, “life”? Is “life” just another way of life? Is life playing or is my life playing? Growing up my life consisted of broken relationships, my mother married three times. We had a part time relationship with our biological father, who also remarried and divorced. Parental figures consisted of a biological mother and father, two stepfathers and one stepmother. We moved changing cities four times before I was fourteen. Family went in and out of favour and friendships were short. Any idea I had about community was formulated by collecting data, including pop cultural references like movies, TV and advertising, information about the process involved, and, creating from it. How do you "create" community? After over 26 years living in the same neighbourhood. Family and close friends now lived within a kilometre of me. I was used to a sense of community. 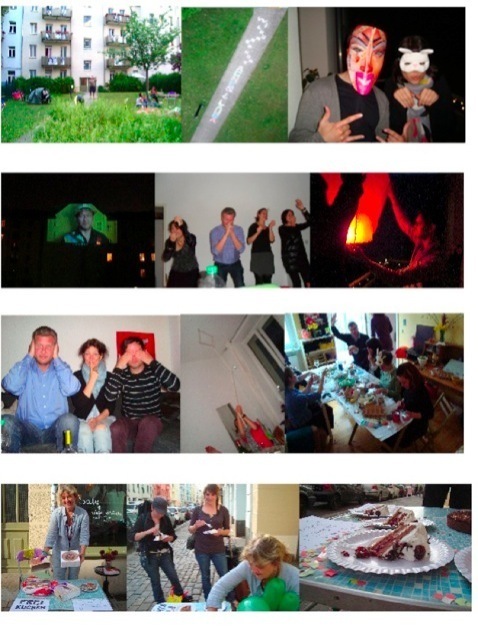 As a result of this, the first thing I did when I moved to Berlin was create a community for myself. I turned the process into an art project. From the balcony of my fourth floor Berlin flat in the back building, I can see into the backs of shops and cafes of the surrounding buildings, so I consider them part of my community. When I moved into the building, there was a shop was called “Frei & Wild” (Free & Wild) next to me. Every day I walked by as a cool silhouette logo image of a woman, wide-eyed and hair wind swept across her face, greeted me. I was in Berlin! Free and wide eyed, ready to absorb, learn, grow, create, have adventures, meet new people and interact with some of the world’s best artists and thinkers. I liked living next to this place. I made friends with Nûria, the young Spanish shopkeeper and Tika, her graceful border collie who hung around under the racks of designer clothes she sold. We talked about my work on love and shared videos and music. I walked her dog and brought treats. After many months of working as a dishwasher nights to afford the rent, she ended up closing up shop. She was a part of my community. It was my community. My community. I owned it. I worked hard to get it. I imagined an interconnection of people caring about the person next to them, a place I could feel comfortable in because I knew who my neighbours were. I imagined people being open to sharing and caring and helping if they could. If there was anywhere I could try to realize this, it is in Berlin where over 50% of the people living here by profession are artists. I wanted to connect with the people around me. I wanted to continue to explore ways to connect and use the knowledge I had gained doing work with love and communication. This was a mission, a belief in a way of living based on research and an experiment into the art of connection. How does one create a community? People come together for many reasons. From a common cause to common blood, common taste, race and food: This experiment’s objective was to create a sense of community by connecting geographically. At the same time, I wanted to explore ways to extend this beyond the physical space by using facebook to interact with my neighbours as part of a larger community. The process of practicing a random act of kindnesses helped build a sense of community and continued to explore means of connection as an extension of the School of Thinking and Feeling. Feb. 29, 2012 Today I bought tulips for the new Burritos Café opening up next to where I live in Berlin. “Hello” ’s, smiles, offer for coffee, stopping to ask a question. Needing, offering and asking for help worked at creating opportunities to share vulnerability. Dinners, making friends, bigger dinners, building dinners with art games, creative play, pictures, leading the way to fun and shared online memories. Invitations, art projects, a courtyard tree decorated with coloured streamers, and flowers. Bubble machines, Christmas cakes, and Easter chocolate eggs, a community exhibit, music concert, food, beer and more beer. The neighbours, who did not know one another before, ended up meeting each other. At some point, they began helping one another with home improvement projects, personal problems and meals. We were “zen”, life was “zen” it was very “zen” in K21. 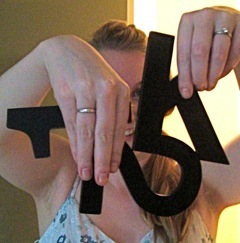 I made a matte black wooden logo made out of 10 cm (5”) Helvetica door letters and numbers. In order of initiation into the K21 community, each one received a uniquely combined Kate Hollett creation. 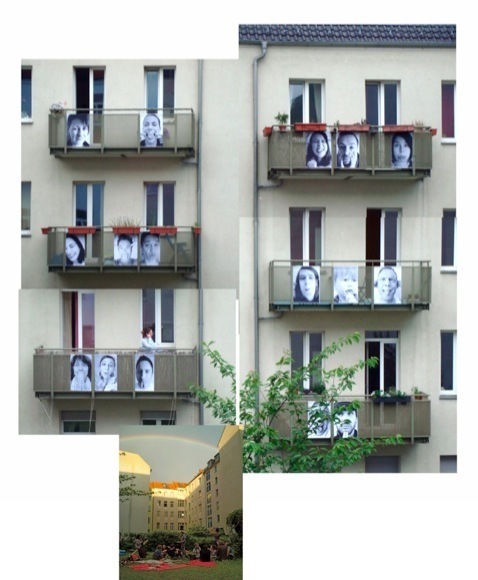 Several K21 art projects took place involving the tenants of the building. Inspired by the work done by JR in Africa and the cartels in Columbia, I explored turning our world inside out. In the art project entitled “Face2Face”, I shot b&w portraits of everyone in the building. Funny faces; laughing, tongues wagging, and hands flailing; the images reflected a sense of play. 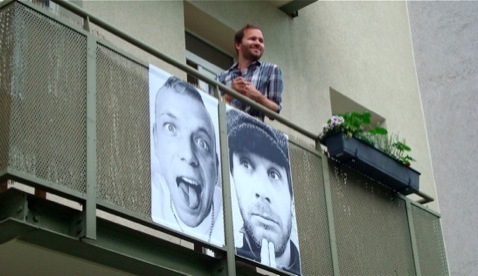 The portraits, 16 in total were blown up to 90 cm and pasted on the six balconies of the building. Everyone was involved. Many participated in the production and the community celebrated the art with friends and neighbours with a community event and BBQ. The art extended the reach of participation connecting with community at large as an extension of K21. ...the kind of lazy hot day, where thoughts melted. The air was full of the scent of coals burning, lighter fluid and grilled meat contrasting the smell of wet grass. There was a quiet calmness in the air. A small rusty tin BBQ grilled würst as purposefully placed beer bottles floated in a bathtub of shiny green grass. …a wooden sandbox, a plastic blue kids pool, candy coloured toys lying about, and a seesaw made of a stripped down tree and old rubber tires. Blankets of red & yellow, heart patterned, batik, and cotton white gave placement to groups of people from the community. The best part of the event came when the sun came out and we saw a double rainbow bridge the buildings surrounding the courtyard. We were in awe, together; a metaphour creating a connection projected in nature. Sitting below the happy faces beaming down on us created warmth. There was an openness to each other that radiated conversations. People met new people, talked with people they had seen in passing, made future plans, shared experiences and placement, “I live on the third floor”, “I am at the back on the second”. Connections were made, and a good time was shared with all. We were a “thing”. We created a connection based on geography that expanded into a sense of shared identity. Art became a unifying factor. As people came and went, so did the invitations, food, walks, talks of love and community continued. 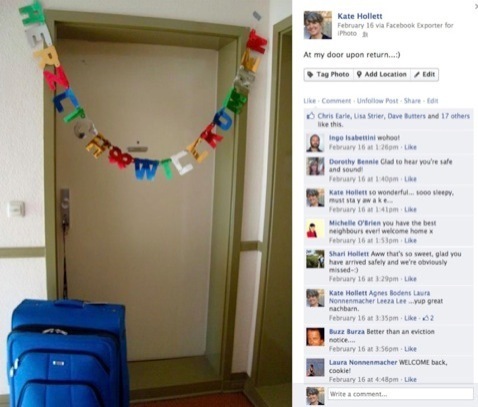 We communicated in the halls and on facebook. Yes, we were friends in a local and virtual world. It was working. It worked. It felt good and the summer was long. Random acts of kindness came easy. A new woman set up a T-shirt business selling stupid tourist slogans. She was tough and built like a cement brick. Her strawberry blonde hair was slickly pulled back. She wore tight jeans and a tight T-shirt over her 40 lbs. of extra circumference. She never smiled and stood outside her shop often looking in, puffing away on a cigarette with her deep red lipstick lips. I tried to say hello a few times. She never responded, but her glare was enough to scare me. I think she was one of those who hated foreigners here. The shop never had any people in it. Eventually she set up lawn chairs, facing towards the entrance on the edge of the sidewalk, she would smoke and drink beer for hours. She was tough. She stared and stared at her shop as if her sheer determination was all she needed to make it happen. It didn’t. It made me sad. I felt sorry for the woman. 5 months. Been a tough year. I was tired. No art play or smile or food could help. Life was hard in Berlin, the economy and dark skies of winter dulled the sense of community. This was hard work. I got tired of making it happen. I had my own dark times, so I stopped. I worked hard and stayed in. I healed wounds and grew sadder. It was dark and gray and I never saw anyone. Everyone was busy and involved in other worlds. I got tired of smiling at people or looking up or listening and being present shoving the Ipod in my ears, I walked as one. It was cold. In her article entitled “The Righteous of Wrong”, Solomon-Godeau talks about Baldassari’s work entitled “Wrong” in terms of criticizing beauty or aestheticism, and the art world’s sense of what is right and what is wrong. In this early and important example of concept-based art, Baldessari casts himself in the role of amateur photographer. A rule of thumb known to every amateur photographer is not to photograph a person standing in front of a tree, lest the tree appear to be growing out of the subject’s head. For this work Baldessari had himself photographed in front of a palm precisely so that it would appear that the tree were growing out of his head. Baldassari’s work relates to the failure of art in as much as it critiques art’s ability to see beyond preconceived notions of success and value. It was the work of artist David Critchley in Pieces I Never Did. 1979/2005 that inspired the possibility of working with the duality of connection and disconnection or as his work suggests a tension between what is a success and what is a failure, what is done and what is not done. He layers footage of a narrative with footage of self-criticism expressed through video of him screaming until he looses his voice or tossing himself into a wall repeatedly. The work reveals the artist’s process and more importantly the irrelevance of success. I went away, back home to my community in Canada, my family and neighbours and friends who knew me well. These were communities that were not fabricated. They took the same work; planning, concepts of shared work and emotional support but the community was formed organically. Even in my fallen state of failure and physical fragility, I was welcomed and given warmth and love. I did not know how to feel this anymore. It was not about art or processing. I was lost in the very idea of connection/disconnection my work was exploring. Had I failed or had I plunged even further into my work? I’d been here before. Connection lead to Disconnection. Disconnection lead to Failure; and in the past, the process lead back to connection, which has lead me here. I felt like I was going around in circles, or is it cycles? Day/Night, Fall/Winter. The heaviness of its significance on my work’s direction weighed heavy as time flew literally by on the plane headed back to Berlin. Up the four flights of stairs with over 75 lbs. of luggage and there it was, a colourful lettered sign hanging from my door. 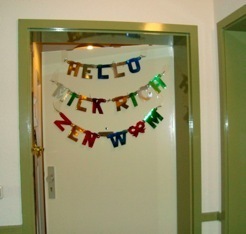 “Welcome Home” in German. Picture, download, post to Facebook. Tag and thank the neighbours online. Hello’s here and there as jet lag dissipated. A few days later, a little red striped man shaped pipe cleaner was hanging from my mailbox slot as if trying to climb in. Picture, download, post to Facebook. Franzi, the 21 yr. old hot pink, spiked haired, black leather, steel spike jacketed, punker on the third floor made it for me to welcome me home. The shop next door opened up again. A young couple, eagerly painted, built and nailed and worked hard. Happy faces and inviting smiles; it was hopeful. The community was ever evolving and participating in ways beyond any perceived idea of success or failure. It was a process. Using the letters of the original HERZLICH WILLKOMMEN sign, I created an anagram. With both a sign up sheet and a facebook post I invited participation to play with a guarantee to re-work the letters in any given new anagram. There is a 4 yr. old boy named Max living in the building. His toys are scattered about the courtyard. Their coloured plastics contrasting the dull winter grass inspired play as a means of rejuvenation for K21. Play as a form of connection. The intent of playing house is to maintain a joyful presence in the courtyard and find ways to inspire creative participation in the community. As a notorious garbage picker, much of my home here was created out of found objects, including the chair I now sit on. I’ve lugged a chair, a coat rack a shoe rack, CD’s, DVD’s, books, tableware, cushions, linens and dishes for kilometres ignoring the odd look of disgust as I grab at a dirty pillow or a wet box of clothes. Berlin was littered with a houseful of ‘stuff’. Playing house could work both as a means of community connection and as a form of repurposed, recylced, sanitorial services for the community. I collected items to use in the courtyard. I found adult toys to create with. Re-using, recycling, re-purposing, reducing, reinventing, reinvesting and remembering... Finding ways to live consuming less and loving more. If you reuse something is that considered consumption? Simple acts of fun and kindness connect. It’s an art project, a game, a personal outreach and community building using art. Flowers found in the compost at the cemetery become individual roses left on the doorsteps of everyone in the building. One person knocks on my door to thank me, and another posts to facebook and tags the building folks. The flowers were free, the time was minimal and the effects were positive, solidifying a sense of belonging now motivating shared action. After going into the rabbit hole I had discovered a sense of play returning to my work. I wanted to play, to create for creation’s sake. To forget about intellectual ideas and research and play with the imagery and experiences I personally found as a real part of life that informed the art. I needed the release of conceptual and local boundaries I had created as a result of critical theory of interdisciplinarity. There was life beyond K21. Surely my art is not one based on separating myself from my own reality? The reach extended to other communities in a colour study of class and attitude in a film created at a party New Year’s Eve Berlin 2012. It was a disconnection with building management that reconnected me to the K21 project. In a recent struggle, I ran into difficulty with the hausmann (superintendent). We played tug o’war over a garden table he tossed after I went down and retrieved it from the trash. He followed cursing, trying to get the table out of my hands. As he continued to toss furniture away, I continued to save it. I cared. The people who owned these things mattered as part of my community. I was connected again and sent a facebook comment to all the people I knew in the building. We looked for solutions. We needed solidarity, and idea of collective ownership of space including its contents like garden furniture we collectively could use and protect. With every tenant invested in the garden, there was no argument for management to remove it or complain. K21 rallied together in favour of a table and everyone was happy to contribute a small amount to pay for it. As I regained my connection to my world, I was spurred into action. What is the German word for “hardware store”? 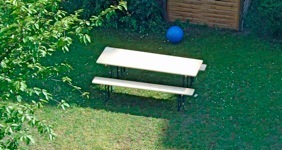 In a period of 2 hours, a building table was bought and set up in the courtyard. Taken a picture and posted it on facebook. That was fun. What next? Perhaps a community BBQ to celebrate? Within a few days the table began to be used. One person reading a paper, a few others walked by sat down to chat. And later, more pass by and stop to share in conversation. Coffee is made and the connections continue. The table became a representation of a shared investment in the community space. 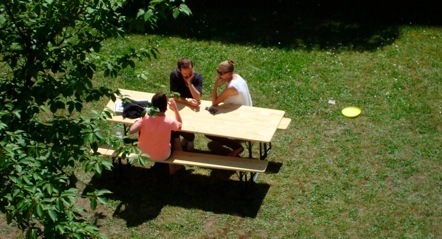 It is a meeting place, a space to share time in conversation beyond a passing “hello”. The table reconnected the neighbours in an outpour of appreciation and warmth among each other. People are talking. Several people have told me how jealous their friends are of our building. They tell me that their friends have lived in places for years and still do not know their neighbours. After a few years now, K21 can talk about shared events and experiences, shared pain and memory, shared space and navigation of boundaries and rules. Is this just life, full of shared experiences, growth and through shared memories. Or is it art, full of intent, conceptual social purpose, creative exploration, and contextual nuance. Is it love? Could it be both?